End of the night at Avanti Mansion in Buffalo! 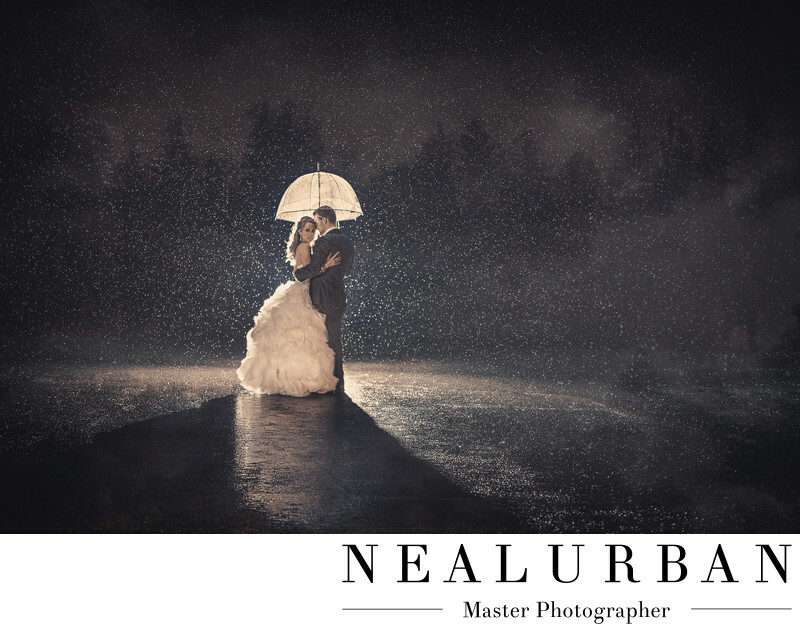 Neal Urban loves when it rains! We can create some very magical and artistic images. Christina and Nick had an intimate candlelight ceremony at the Avanti Mansion. Their reception directly followed the ceremony. This does not allow us too much time for photos. Since they were both getting ready there, we did most of the bride and bridesmaids photos and groom and groomsmen photos at that time! Then after the ceremony, we did a few group shots and then the bride and groom portraits. We knew we wanted to get some amazing images during the reception. We always try and take the bride and groom for one last photo session at the end of the night! It started to rain and Neal had this idea. We brought the newlyweds out to the middle of the parking lot. We tried to go to the darkest part too. The only light we wanted was the light we were going to use. we placed a flash behind the couple. We also gave them a clear umbrella. We wanted to back light them and light up the umbrella. Then we had another light on their faces. The only post work that was done was to brighten up the back ground to see the tree line. You could faintly see it, but we wanted it a little brighter. We loved their pose too! We had them looking at each other first. Then we asked Christina to look back toward us! This image is so mysterious and magical!